“Medipack” tablet counting and filling machine adopts advanced vibration and multi-channel feeder, computer control, dynamic scan counting, transfer the bottle automatically, system test automatically. The machine With Stop automatically function and other advanced technology. This machine designed with GMP standard. Compose the light, electric machinery to one set, which is suitable for tablet or capsule counting and filling in pharmaceutical or food business. Medipack offer various type of tablet to fill in a bottle with require speed. 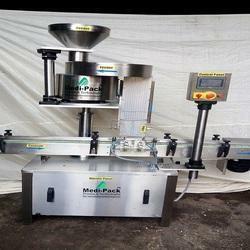 Now medipack have a complete range of tablet filling and packaging machine. Stable operation and lower noise. Bottle convey smoothly with SS Slate conveyor. The full-set protecting device keeps operation steady and reliable. Intellectual touchscreen Control System (Delta) which is easy to control. Simple Straight Forward Operator Controls. On-Screen trouble description which is easy to solve. Medipack offer various type of tablet to fill in bottle with require speed. 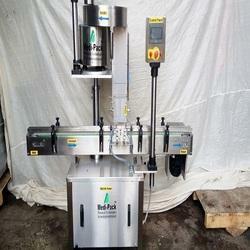 Now medipack have complete range of tablet filling and packaging machine. TABLET COUNTING & FILLING MACHINE “Medipack” tablet counting and filling machine adopts advanced vibration and multi-channel feeder, computer control, dynamic scan counting, transfer the bottle automatically, system test automatically. The machine With Stop automatically function and other advanced technology. This machine designed with GMP standard. Compose the light, electric machinery to one set, which is suitable for tablet or capsule counting and filling in pharmaceutical or food business. • Stable operation and lower noise. • Bottle convey smoothly with SS Slate conveyor. • Full-set protecting device keep operation steady and reliable. • Intellectual touch screen Control System (Delta) which is easy to control. • Simple Straight Forward Operator Controls. • On-Screen trouble description which is easy to solve.